McDonald's are just days away from serving their new Christmas menu and we have taken a sneak peak at what's on offer. The festive season is nearly upon us and that means Christmas flavoured food and beverages are everywhere we go. McDonald's new Christmas McFlurry is on sale now. 'Tis the season for hot chocolate, mulled wine and mince pie. But there is one ice cold treat that you might want to add to your Christmas wish list. McDonald's have revealed their festive-themed McFlurry, combining the fast-food chain's famous soft serve ice cream with mini Malteser reindeer. To mark the start of the Christmas season, McDonald's will begin serving the limited edition Maltesers Reindeer McFlurry across the UK from Wednesday, November 21. The Yuletide inspired dessert combines the ice cream with mini Malteser reindeer and a sticky chocolate sauce. The Christmas McFlurry will be served in two sizes, with a regular size priced at £1.29 and a mini version for just 89p. And if you fancy something Christmassy to warm you up afterwards, you won't have to go far. McDonald's are already serving their Christmas drinks menu, which boasts the new Millionaire's Latte. The limited edition hot drink is made up of a large shot of espresso blended with steamed milk and a caramel biscuit flavour syrup, topped off with a swirl of chocolate cream and a caramel drizzle. The festive drink costs £1.99 for a medium and £2.99 for a large. 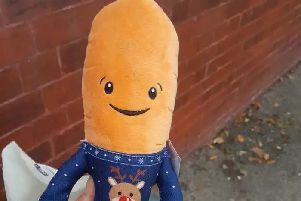 McDonald's has offered its customers some inspired Christmas treats in recent years. Last year, Mcdonald's brought back its Terry's Chocolate Orange McFlurry for the second year in a row. The limited edition Christmas menu has also included the mincemeat and custard Festive Pie, a spiced cookie latte and Camembert Cheese Melt Dippers.